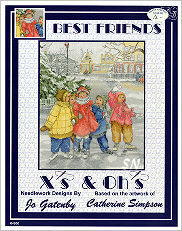 X's & Oh's has charted artwork from three Canadian artists and presents them in Cross Stitch. 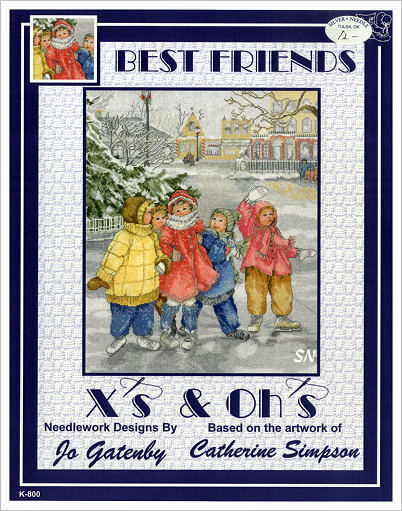 Lovely designs that look like they came from the pages of old story books, I just love all three of them. They are pretty intense as far as the stitching and charts are concerned, so I will probably only enjoy them from these leaflets, and never the real stitched pieces! 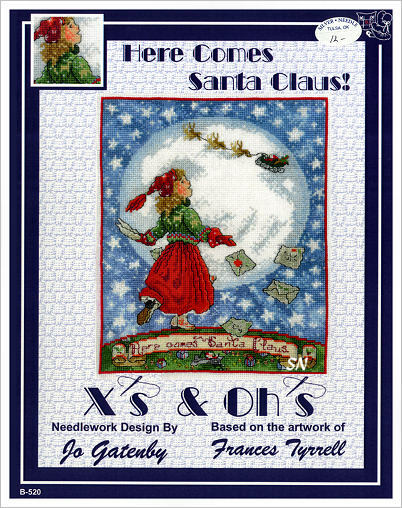 They are all solid stitching, so choose fabrics that are easy for YOU to work on... you might want to consider white for Here Comes Santa -- and leave the moon's inside empty. 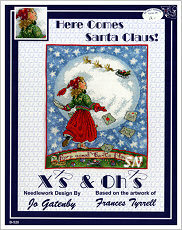 Here Comes Santa Claus -- By Frances Tyrell, Santa's sleigh up in the sky is only 10 x 15 stitches!!! Finishes approx 7 x 9 on 32ct, using 28 DMC colors. 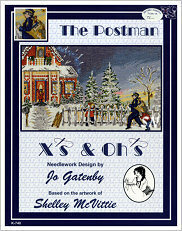 The Postman -- By Shelley McVittie, I think The Mailman is picking up letters to Santa! (but maybe not... only the holly garland on the railing suggests Christmas.) 13-1/2 x 8-3/4 on 32ct, 35 DMCs, lots of shading in here, not much backstitch. 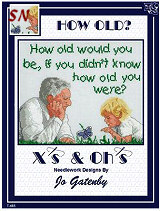 *How old would you be, if you didn't know how old you were? * I love this! It's appropriate for so many settings and people!!!!! Offered as a leaflet, it finishes approx 8 x 10 on a 14/28ct and is coded for DMC or anchor floss. The model is worked on a very light blue -- so the whites in the shirts shows up. An uplifting lesson to life -- possibly for someone you know?? ?